A couple of recent polls show Cary Kennedy, former State Treasurer and Denver chief financial officer, and Walker Stapleton, Bush scion and current State Treasurer, the frontrunners for governor leading their respective parties, with a third or more of voters undecided. The early polls measure name identification and media covered events. Among the Democrats, Kennedy surged from the pack and caught up to the earlier frontrunner, Congressman Jared Polis, due to winning decisively the party caucus in February and a gaggle of March county conventions. Assuming Mike Johnston doesn’t just plan to fade away, the race won’t really shake out until political punches are thrown and shots fired at and after the April state convention. Johnston has considerable money for the two-month battle. Nor will Polis give up his chance to be governor without putting up an expensive fight. The alternative is the likely end of his decade-long quest to have political influence equal to his wealth and ambitions. Stapleton’s campaign’s sudden shift from petitions to convention delegates adds an element of drama to the April 14 state convention (4,200 Republicans assembling in Boulder). 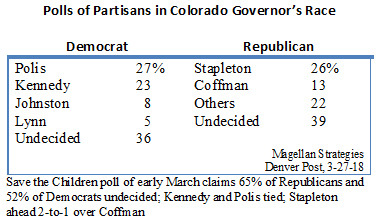 But, Stapleton is still the frontrunner for the nomination. His advantage derives from the Republican establishment’s belief that he has the best chance to win the governorship in what will likely be a friendly Democratic year. But, Vic Mitchell with advertisements already up and Doug Robinson on the attack against Stapleton are ready for a high-profile brawl. Although her early campaign was late and weak, some still consider Cynthia Coffman the best statewide candidate. These races will also kick into high gear at the state conventions. Just remember what a Stapleton assembly looks like.